OK, so it wasn't so bad that I needed like therapy or intervention or anything LOL, but I still wanted something on my nails that I knew would not disappoint. What's a girl to do? Why, pull out a holo of course! 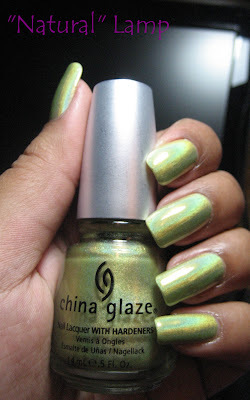 China Glaze L8r G8r from the OMG Collection. The overcast pic is actually one of my favorites. 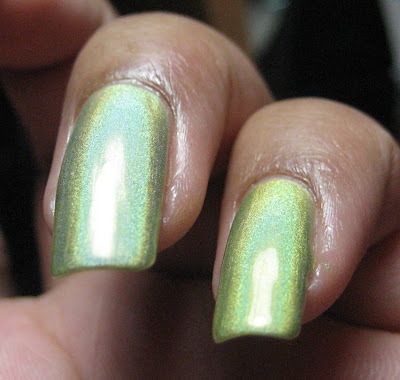 This is just a really cool tone of green when it's not in direct light & the holo gets so muted it's almost invisible. One thing I've noticed the past couple manis is, now that my index finger is finally growing out to a decent length, it has a considerable curve to it on one side. It's not the most aesthetically pleasing thing some of the time, it photographs kind of lopsided, but other times or different colors it's barely noticeable at all (I thought it looked much worse with the pink french than with this holo). I have a feeling that my index & possibly my middle finger on my right hand will be the same way once I finish growing out the peeling & they start to hold on to some length. All I can say is ... sorry. LOL if you want to see my polish you'll just have to get used to my little mutie nail. Because I don't think it can be fixed & I'm not cutting my nails down back to the point it wasn't as noticeable. Pretty bright compared to what I normally put on my toes ... I'm more likely to do a denim blue or a dark purple but I've gotten several compliments on this color. If the sun comes out anytime soon, I'll get a few more pics, and some of the color changing pair also, but it's looking pretty gloomy the next few days =( Thanks for reading. That ChG polish is stunning. A must have for me, thanks for enabling :) I think we all have an oddball nail, but it's usually more noticeable to us than others. MARY - It seems like you see OMG on almost every blog - and it will eventually make an appearnace here too =) - but the rest of the collection doesn't get as much love unless someone is actually doing the entire collection. I think you're probably right on the nail too - seeing the pics enlarged while I'm editing doesn't help either LOL. L8r G8r is hotness, I really need to get on the train and buy this, looks amazing on you. 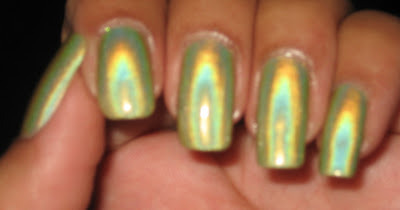 That's one of my favorite holos - I always feel like my nails are dressed in satin when I wear it (and I always top-coat it too...it's still super-blingy). Lovely, and that color on your toes is gorgeous! 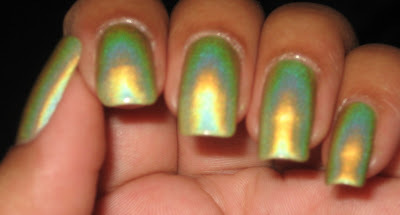 This holo is soooo pretty. Glad you posted it. Nice color on the toes too. I've worn that same color on the feet. Your holo pictures are just beautiful. Thanks for all the pictures. Your nails look gorgeous. I have a nail that's a little wacky also. Yours really isn't noticeable. 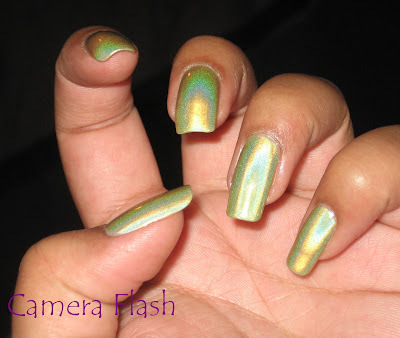 I love the holos. I'm trying to get them all. THE PRETTY BROWN GIRL - I've got so many left to swatch! I'm going to say around 20 LOL! & I can barely wait, every one is so awesome. wow that looks sooooo good! awesome of you to take all those pictures!